Check out this recipe featured on the mega site The Kitchn! 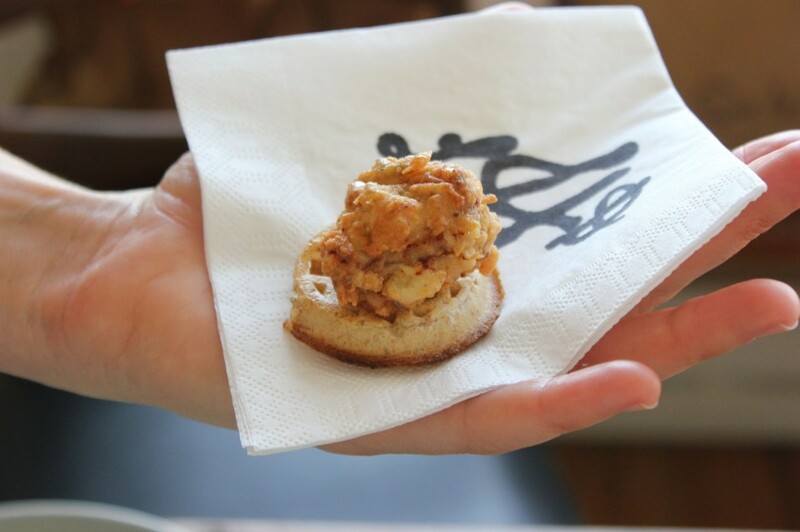 By FAR the biggest food sensation of our wedding day was these mini chicken n’ waffle appetizers. The In n’ Out Truck for dinner, Sarah’s divine spiced nuts, a buffet of homemade desserts and hot french fries that arrived at each table in silver Revere bowls were no match for these tasty hand held treats. Many friends (and a few parents) have admitted to waiting at the kitchen door where the servers walked out with the trays in order to take down a whole tray’s worth. The servers had to start taking a secret route in order to get through the crowd. Since I never got to eat or see even one appetizer that day (joy, pictures, hugs and congratulations), Sarah and I have recreated the recipe to share with all of you. I wanted the wedding appetizer’s to be Southern themed as a nod to Drew’s heritage. My fantastic caterer, Dan Molnar perfectly executed my whimsical menu of Mini Chicken n’ Waffle Bites, Mini Pulled Pork Sandwiches, Watermelon and Mint Skewers and Crudite with Americana Dips. This is what I imagine they tasted like that day. Enjoy! Remove the leaves from 5-6 sprigs thyme and mince finely. Set aside. Cut the chicken thighs into small ½-inch square pieces leaving some skin on each little piece. Toss with 1 teaspoon of salt, a few grinds of freshly cracked pepper and 1 tablespoon of the minced thyme. In a medium bowl mix the buttermilk with 1 tablespoon of hot sauce (I like Texas Pete) and add the seasoned chicken pieces to the buttermilk mixture. Stir well and add any remaining sprigs of thyme to the buttermilk. Cover and refrigerate overnight. 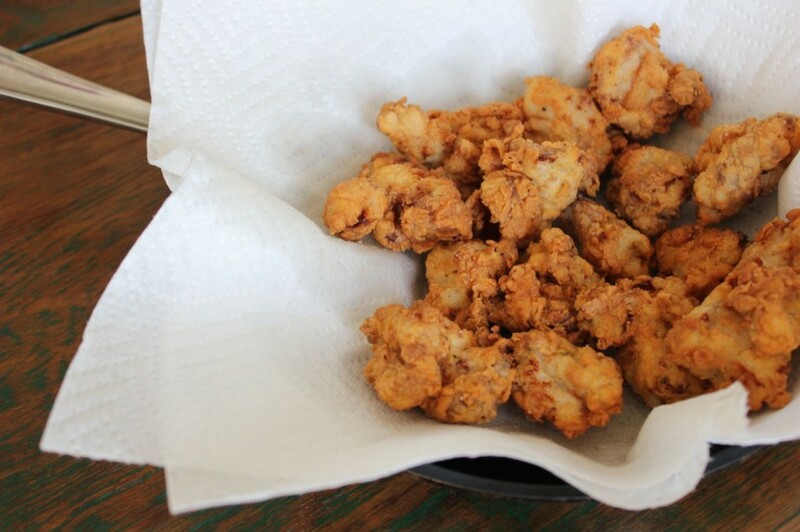 Remove the chicken in buttermilk from the fridge and drain in a colander. Scoop 2 cups of flour in a pie plate or shallow bowl and season with 2 teaspoons salt, black pepper and ¼ teaspoon cayenne pepper. 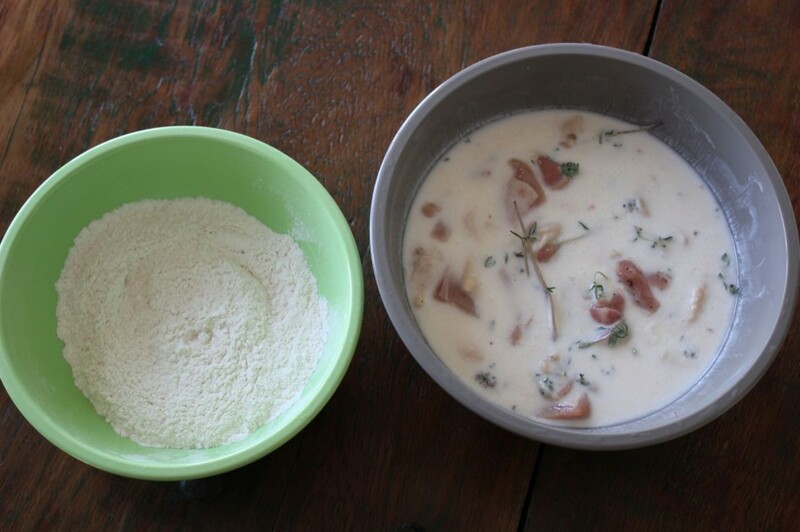 Add the chicken pieces to the flour mixture and toss well, thickly coating each piece. In a large saucepan heat 2-3 inches of peanut oil to high heat, (approximately 350 degrees). Carefully add your chicken in batches, being mindful not to splatter or crowd the pan or the temperature of the oil will drop. Stir occasionally until nicely browned on all sides and then remove to a paper towel to drain. Repeat with remaining chicken pieces. 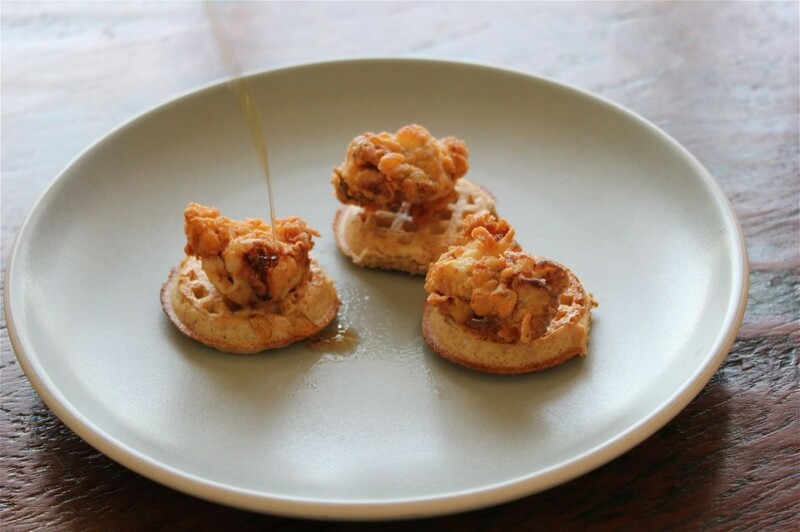 Toast the mini waffle rounds until golden brown and top each round with a piece of warm fried chicken. 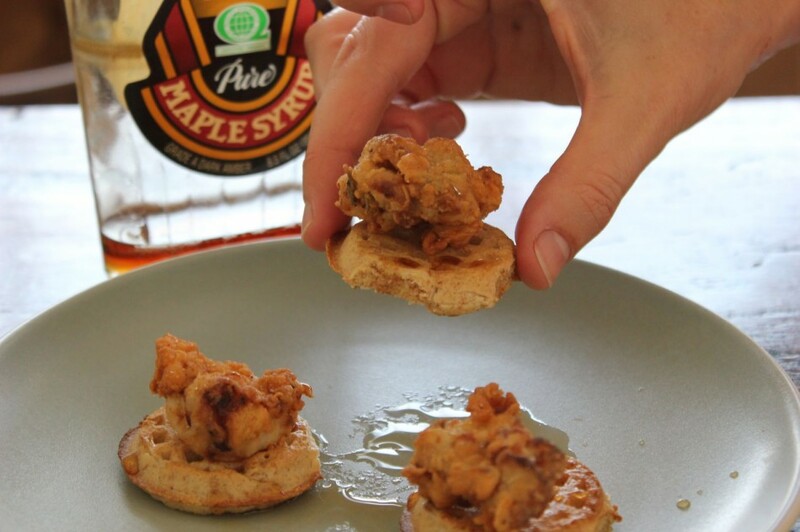 Drizzle with warm maple syrup before serving.